Christian Ponder (right) began the season as the Vikings' starting quarterback, but due to injuries and inconsistency he was later replaced by Matt Cassel. For all of the criticism the Minnesota Vikings took this season, the offense might have received more than its fair share. The inconsistency at quarterback overshadowed an offense that was in the top half of the league, despite the issues at the most important position. Minnesota (5-10-1) used three different starting quarterbacks, yet finished 13th in the NFL in yards gained (344.4 per game). The Vikings’ 5.4 yards per play tied for 10th in the league. Minnesota benefitted from an unexpected big-play offense. The Vikings were only 19th in first downs per game and third-down percentage (36.4 percent) and were 30th in average time of possession (27 minutes, 39 seconds). Yet, the offense led the way this season, and was tied for 14th in the league averaging 24.4 points per game. The offensive line was maligned early in the season. Expected to be one of the pillars for the Vikings’ offense because of the continuity, the run and pass blocking didn’t hold up early during Minnesota’s roughest stretch of the season. All five starters — left tackle Matt Kalil, left guard Charlie Johnson, center John Sullivan, right guard Brandon Fusco and right tackle Phil Loadholt — returned after starting every game together last season. In reality, the entire blocking group didn’t change in the offseason with all three tight ends and fullback Jerome Felton back as well. Yet, after opening a big hole on the first offensive play for a 78-yard touchdown by Adrian Peterson, the blocking wasn’t as consistent early this season. Partially because of a lack of holes, Peterson went over 100 yards just twice in the first seven games (of which Minnesota lost six). But the run-blocking improved, Peterson and his backups got going, and the Vikings finished as the league’s eighth-best running team. There were pass protection issues, at times, too. Christian Ponder might have contributed to the high sack totals. He had a sack percentage of 10.2 percent, which was tied for the second-highest total in the league. He was sacked 27 times of the Vikings’ 44 total sacks allowed, which was tied for 10th in the NFL. In contrast, Josh Freeman was sacked once in his one game with the team, when he attempted 53 passes. 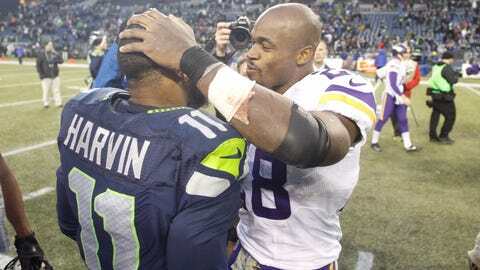 Matt Cassel was sacked 16 times for a sack percentage of 5.9 percent, which ranked 13th in the league. Cassel’s ability to get the ball out of his hands quickly — and stand in the pocket strong while sensing the pass rush — helped Minnesota’s offensive line look better than it had with Ponder. Ponder shares in some of the responsibility for the sacks. According to Pro Football Focus, Kalil allowed four sacks, 12 quarterback hits and 33 quarterback hurries, a shade behind his strong rookie season last year. Sullivan allowed a line-high five sacks. The right side of the line with Fusco and Loadholt were especially strong in run blocking, with Pro Football Focus ranking both in the top-5 at their respective positions in that area. Johnson was the line’s lowest-ranked performer, per Pro Football Focus. Each position seemingly must be graded on a curve, with the quarterback play creating dramatic swings in efficiency and production. 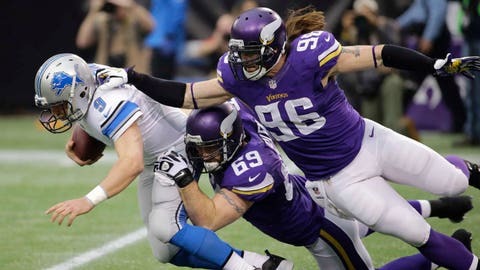 The loss of Kyle Rudolph was certainly felt, and much of his season was played when Ponder was at quarterback. He finished with 30 catches for 313 yards receiving and three touchdowns in eight games, and was never able to return from the broken foot he suffered. Rudolph’s pace of 60 catches would have been second on the team, his pace of six receiving touchdowns would have been first and he was on pace for the third-most yards. In his place, John Carlson had a resurgence until he was forced to miss time. In 13 games and eight starts, Carlson had 32 catches for 344 yards and continued to give the Vikings a weapon in the middle of the field like Rudolph had been. Rhett Ellison dealt with injuries too. Chase Ford, in a replacement role at the end of the season, showed some receiving potential with 11 catches for 133 yards. He had five catches for 43 yards in the season finale. The tight ends, particularly Rudolph, Carlson and Ellison, have a part in some of the inconsistency in the blocking. They each had some success receiving the ball, though it’s apparent now that, despite the talk of having a system capable of two tight ends contributing in the passing game, Minnesota’s offense only had room for one receiving option at tight end at a time. Easily the most improved position on the entire roster. Unfortunately, Minnesota seemed to only discover the new talent later in the season. 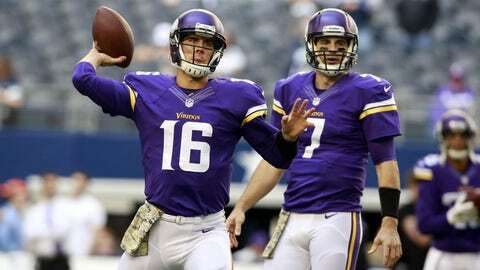 Cassel’s games at quarterback made the receiver position look much better than when Ponder was at quarterback. Greg Jennings was the high-paid free-agent who came to be the No. 1 receiver, but he was nearly invisible with Ponder at quarterback. Jennings and Cassel had a rapport and the two brought the best out in each other. Jennings still ended up leading the team with 68 catches for 804 yards and caught all four of his touchdowns from Cassel. Cassel and Jennings were the show in the win against Philadelphia. Without Peterson playing, Jennings set a career-high with 11 catches and was just off a career best with 163 receiving yards. Jerome Simpson started the season as the No. 2 receiver and really was Ponder’s main outside target. He lost his starting spot after a midseason arrest, but still came up with several timely and tough catches throughout the year. He finished second on the team with 48 catches and 726 receiving yards. His production tailed off toward the end of the season, but he was more about quality than quantity with his big catches. Simpson gave way to Cordarrelle Patterson as the season progressed and the "flashy"rookie displayed his immense talent. Patterson finished third on the team with 45 catches and 469 receiving yards. His four receiving touchdowns tied Jennings for the team lead. The biggest question with Patterson is what took so long? When it came to his role in the offense, the coaches treated Patterson with kid gloves. Through the first 10 weeks, Patterson never had more than three catches or 49 receiving yards in a single game. Then he became the big-play weapon the Vikings traded four picks to draft. He had three of his four receiving touchdowns over the final four weeks. He had his first 100-yard receiving game when he took a short pass 79 yards for a touchdown in Baltimore and also showed his versatility by running the ball out of the backfield to go with his league-leading return ability. Jarius Wright showed some big-play ability himself as the third and sometimes fourth receiver, giving Minnesota depth at the position. Wright had 26 catches and averaged a team-high 16.7 yards per catch. With Jennings, Patterson and Wright all under contract, the next coaching staff has something to build on from with the receiving corps. Joe Webb, in his transition from quarterback, played sparingly and when he came on, was utilized mostly as a run-blocker. He had five catches for 33 yards this season. The league’s No. 8 running team was more than Adrian Peterson this season. Peterson still proved to be one of the league’s best backs but wasn’t the dominating force he was last season in winning MVP. After taking the first handoff of the year for 78 yards and a touchdown, Peterson found the running room a little sparser this season, and had to play without his Pro Bowl fullback early on. Felton served a suspension and missed the first three games. Peterson also dealt with several injuries. First it was a hamstring injury that he played through, and then a groin injury. He kept playing despite obviously being limited. He missed two of the final three games with a sprained foot. Through it all, he finished fifth in the league in rushing with 1,266 yards and added 11 total touchdowns. His average of 90.4 yards per game was second in the league behind LeSean McCoy, who averaged 100.4 yards per game and led the league with 1,607 yards. But again, this rushing attack was more than just Peterson, and it needed to be. When Peterson was out of the game, backup Toby Gerhart filled in and showed why some team might decide in free agency to sign the little-used backup and give him a shot at more playing time. Gerhart averaged 7.9 yards per carry this season and exploited the holes the offensive line was giving him, bursting through the opening instead of hesitating and waiting for the perfect hole. Gerhart’s biggest opportunity came at Baltimore when Peterson left early because of the sprained foot and didn’t return. Gerhart had 15 carries for 89 yards, including a 41-yard touchdown. At Green Bay, he had eight carries for 91 yards, and against Seattle’s tough run defense he took seven carries for 67 yards. When Minnesota was forced to play two games without Peterson and Gerhart, Matt Asiata stepped in and kept the running game going. He had 30 carries and three touchdowns in one win and 14 carries for 115 yards in another. Where to start? Jack Bauer might not be able to get to the bottom of what exactly happened with the Vikings’ quarterbacks this season. Ponder came into the season as the unquestioned starter, the team hoping he could build off the positive run at the end of last season. He was hardly able to replicate the success he had then and was again plagued by two factors that will define him: inconsistency and injuries. Turnovers were a big issue, as was the general discomfort in the pocket. His two-plus year run as the starter was finally over late in the season when the coaching staff decided to play Cassel over a healthy Ponder. Ponder, the No. 12 overall pick in the 2011 draft, had a 77.9 quarterback rating, which was 28th in the NFL. He threw nine interceptions to seven touchdowns. He added four rushing touchdowns but fumbled six times, losing four. He completed 63.6 percent of his passes, which actually ranked 10th in the league. But his 6.9 yards-per-attempt average was 21st. Ponder just couldn’t make enough plays with his arm to give the organization belief he would turn into the franchise quarterback they have long sought and thought they were drafting. And now Minnesota is starting over again at the position. The Vikings will head into a critical offseason looking for a new coach and franchise quarterback. The two positions are so intertwined and Ponder played a big role in Leslie Frazier’s fate. Ponder is signed through next season. He could return, but it’s likely a parting will be best for both sides. Cassel could potentially return. He could either be a veteran backup or a temporary bridge to finding a franchise quarterback — maybe, say, one drafted No. 8 overall. He owns a player option on his contract for next season, which would pay him $3.7 million. He said he is open to a return and maybe starting at the end of the season has given him personal hope in Minnesota. Cassel wasn’t perfect, but the effect he had on the Vikings’ offense was easily seen. Minnesota has the pieces for an effective offense, and Cassel giving the team steady, if unspectacular play showed the potential. He ended as the only quarterback to throw more touchdowns than interceptions. He had 11 touchdowns to nine interceptions and had a team-high 81.6 quarterback rating, which ranked 25th in the league. He completed just 60.2 percent of his passes, but did average 7.1 yards per attempt, which was tied for 15th in the league. Perhaps we will never know the full details behind the Josh Freeman saga. He signed with the team during the bye week, five weeks into the season. He surprisingly started two weeks later and looked as unprepared as many would have expected. He then attempted 53 passes in a strange game and was never pulled despite looking unsure and inaccurate. He finished 20 of 53 for 190 yards passing and one interception in his one game in a Minnesota uniform. After the way the season finished, with Freeman a spectator the final 10 games, it’s unlikely he’ll be back. After being run out of Tampa Bay, where he was once believed to be the long-term quarterback, the Vikings took a worthy chance to see if Freeman could find his game in Minnesota. While he never saw the field after his awkward debut, the coaches and management got the chance to see Freeman on an everyday basis and see how he works. They’ve surely done all the research they need to do on Freeman, who is a free agent. 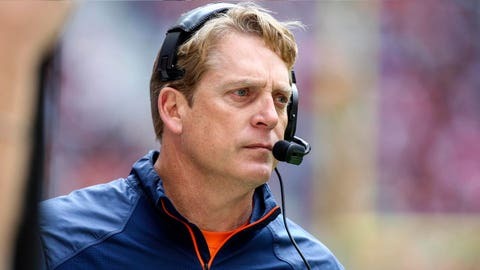 We will know soon enough whether the issues were Freeman, or the coaches. Blair Walsh was a revelation as a rookie, making the Pro Bowl last year in his first season. His sophomore season didn’t live up to the same high bar, but he’s proven himself as one of the league’s best kickers. Walsh’s success on field-goal attempts of 50 yards or more was snapped. After making all 10 attempts last season, he was 2 of 5 from 50 yards and beyond this season. Walsh did deal with a hamstring injury during the early part of the season, which might have contributed to some of the inconsistency. Walsh finished the season 26 of 30 (86.7 percent) on his field-goal attempts after making 92.1 percent last year. 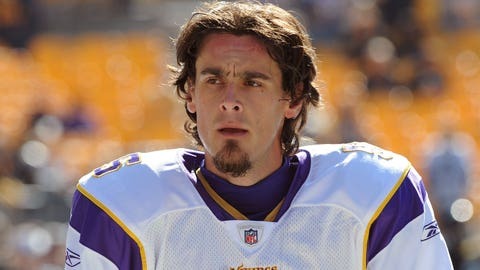 He was 18th in the NFL in field-goal accuracy. He also missed the first extra-point attempt of his career this season. After ranking third in kickoff touchbacks and touchback percentage last season, Walsh slipped to 10th and 15th, respectively, in each category this season, with 51.2 percent of his kickoffs going for touchbacks this season. Walsh was 30th in the NFL this season with a 40.2 net kickoff average. The offseason move that was put under the microscope again after former punter Chris Kluwe said he was replaced partially for being outspoken was rookie Jeff Locke being the replacement. After a mediocre 2012 season by Kluwe in which he was 22nd in gross punting average and 17th in net punting average in the NFL, Locke was drafted in the fifth round. Kluwe averaged 45.0 gross yards per punt last year and 39.7 net yards. Locke had an inconsistent first season, but ultimately provided very similar numbers to Kluwe. Locke seemed to get better as the season progressed. He averaged 44.2 gross yards per punt, which was tied for 23rd. He averaged 39.2 net yards per punt, which was tied for 18th in the league. Locke, said to be drafted in part for his directional kicking ability, had three touchbacks and 23 punts within the 20-yard line. One’s flashy, the other might be the most unassuming player in the NFL. Together they gave Minnesota elite returning ability this season. Patterson made his immediate mark on the NFL as a returner and was named first-team All-Pro as a result. Patterson set a new Vikings record with 1,393 kickoff return yards. He set a new team record and led the league with a 32.4-yard average on kickoff returns. He was so dangerous — the only kickoff returner with two touchdowns — teams flat out stopped kicking to him. He wasn’t able to break big returns, but Minnesota still ended up with prime field position as a result. Patterson will be headed to the Pro Bowl as a returner, replacing Antonio Brown, a punt returner. In the initial voting, the league named two punt returners to the Pro Bowl, Brown and Dexter McCluster. When it needed a replacement, the league took Patterson even though kickoff returns have been taken out of the game. But when it comes to the two punt returners initially named to the Pro Bowl, both trailed the Vikings’ Marcus Sherels in return average. Sherels is one of the smallest players on the field and definitely one of the quietest, but he continues to make himself valuable against long odds. Sherels averaged 15.2 yards per punt return this season, just behind Baltimore’s Tandon Doss for the league-lead at 15.6. McCluster did have two touchdowns, the only punt returner with more than one. But Sherels did have one touchdown return, an 86-yarder. Sherels is sure-handed, which keeps him in the job. But he’s shown he can break a return, too, and is shifty and quick.